Want to learn more about asymmetry and in all three dimesions? Take Ikebana lessons! Ikebana is basically arranging cut stems, leaves, and flowers in vases with – what it seems – loads of rules to consider. One of these rules is asymmetry or uneveness. Therefore, no part of the composition should mirror another one. Practioners believe that asymmetry is a representation of nature where no absolute symmetry is to be found. Symmetry (syn=same; metric= measure), on the contrary, stands for immobility and stagnation. 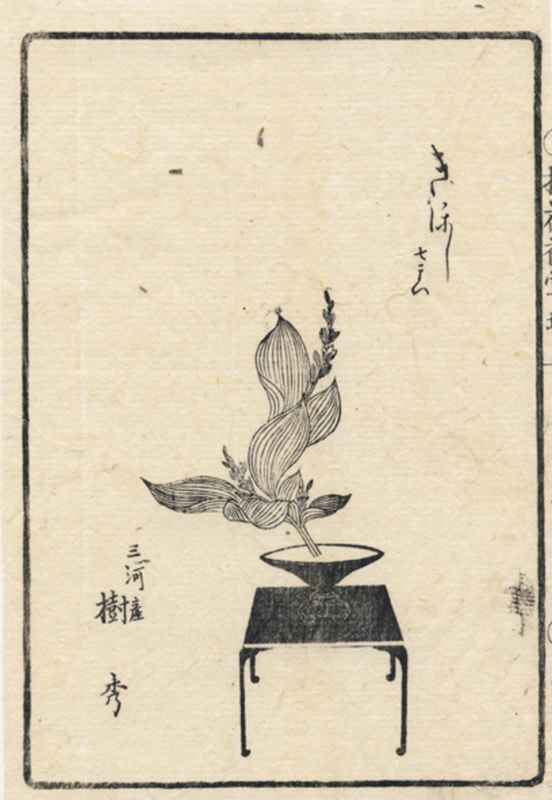 Ikebana’s origin is said to go back to the early 17th century. At that time, the simple floral offerings of three stems to Buddha by Japanese monks took on a certain style: The main branch was usually not straight but bent out to the right or left before its upper part returned to the central vertical axis. This sounds complicateld but you can imagine it like in the picture above. From then on, asymmetry became one of the distinctive features of Ikebana. Later on, when another style evolved -now the basis of all ikebana styles-, asymmetry stayed one guiding principle but in a slightly different way: the main three branches are now to be positioned in a asymmetrical or scalene triangle. Images by: zen-images.blogspot.com. Make sure to check this blog for more amazing Ikebana arrangements. Even if the importance of asymmetry is stressed throughout all the texts I’ve read about Ikebana on- and offline, it is -funny enough- seldomly really explained how to put it into practice. Some hints are that the number of items used has to be odd and the stem lengths have to vary, i.e. they shouldn’t have the same height. In addition, a balance of 30/70 should be adapted (as opposed to 50/50) meaning that the principal elements should be either centered around the left or the right hand side of the composition. “Just do it” seems to apply here, if you want to find out more and get the real feel of it.